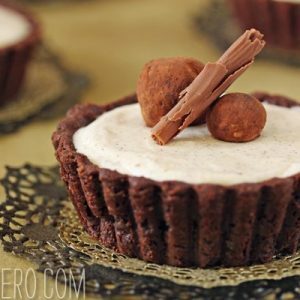 These Baileys Chocolate Caramel Tarts are outrageously good! 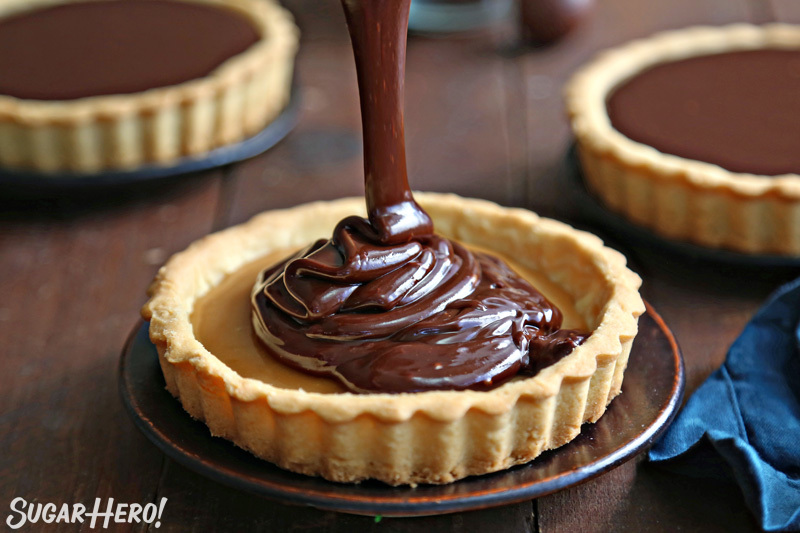 With their buttery tart shells, Baileys salted caramel filling, and glossy chocolate topping, these mini tarts are delicious, gorgeous, and great for St. Patrick’s Day–or any time of year! I love every recipe I share here with you, but I am especially excited to share these gorgeous mini tarts today. They’re made with Baileys Irish Cream, so you can call off the hunt for the perfect St. Patrick’s Day dessert now. But there’s no law that says we can only enjoy Baileys one holiday a year (thank goodness! ), so I’m sharing these with you in the hopes that they become your new favorite go-to when you need a sorta fancy, but also really easy, tart recipe. Gold leaf (if you’re fancy!) or store-bought chocolate truffles, or both! Let’s break these tarts down. They start with my tried-and-true tart dough. It’s the BEST because it’s super crisp and buttery, easy to make in the food processor, and requires no fiddly rolling and chilling before pressing it into the pan. Basically, it’s the little black dress of tart doughs, and I love any excuse to make up a batch! 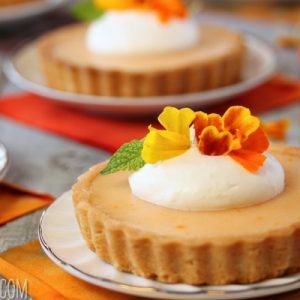 This tart dough is wonderful with these chocolate/caramel flavors, but it also works beautifully with fruit, like in these Persimmon Almond Rosette Tarts, and this Candied Kumquat Tart. 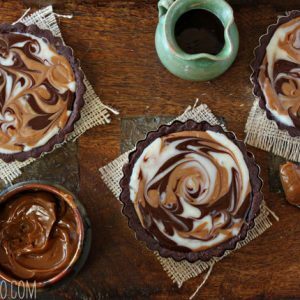 If you want a chocolate tart dough variation, check out these Dulce de Leche Swirled Tarts, or these Matcha Chocolate Tarts. The first layer of filling is a salted caramel made with Baileys Irish Cream liqueur. Caramel may seem intimidating, but for these tarts, we’re taking the cheater’s route and using store-bought caramels. I know. But I was thinking of you! The tart already has 3 components, so I wanted to simplify the recipe a bit. Plus, the addition of Baileys makes the caramel really flavorful, and more than makes up for the usual mediocre taste of wimpy store-bought caramels. The top layer is a silky-smooth chocolate ganache made with equal parts Baileys and cream. The Baileys flavor is a little more subtle in this layer, just a light note in the background of the dark chocolate ganache. I love all the textures in these tarts. 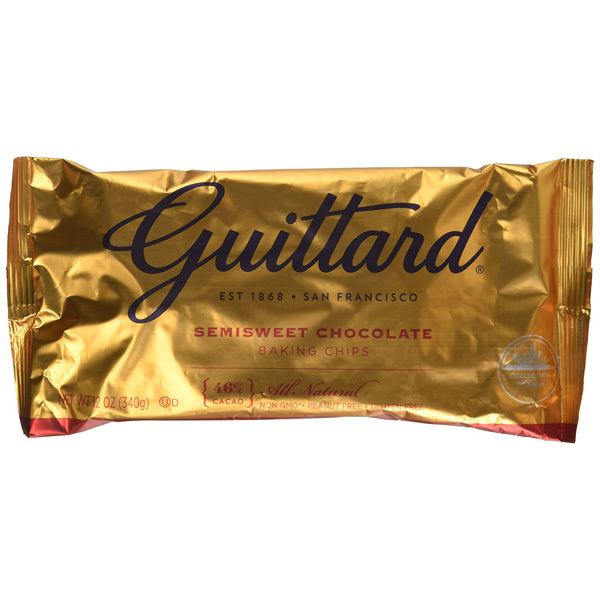 The shells are crisp and buttery, the caramel is soft but not runny, and the chocolate has a similarly luscious, in-between texture: substantial enough to hold its shape when you cut into it, but soft enough so that it starts melting as soon as it hits your mouth. B) this recipe is ABSOLUTELY for you. I didn’t find the final flavor to be overwhelmingly alcoholic, at all, but if you’re not into it, you can swap heavy cream for some (or all!) of the Irish Cream, and it will work out just as well. This recipe comes together easily, so you’ll have a little time to finish these tarts and really make them pop. You have a lot of finishing options! 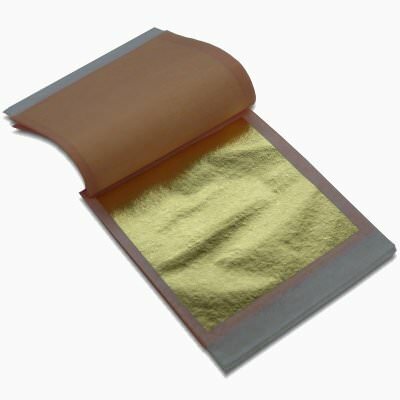 Gold leaf — if these are for a special occasion! It’s edible, easy to apply, and did I mention the BLING? Round chocolate truffles – I used caramel Lindt truffles and they were gorgeous and so fast and simple! A drizzle of caramel sauce. Caramel on your caramel? Yes please! Listen–I will be the first to tell you the gold leaf is NOT necessary, so don’t be intimidated by these pictures. However, it IS a really fun touch for a dessert inspired by St. Patrick’s Day! If you have some, try adding a few flecks to the top of your chocolate tart and bask in the beauty. 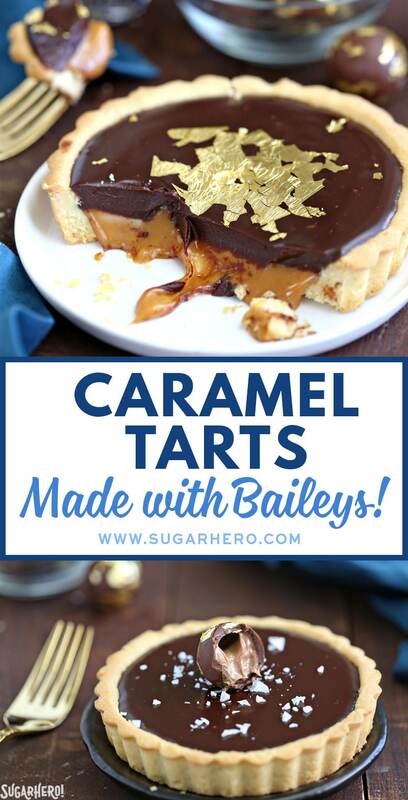 These Baileys Chocolate Caramel Tarts are outrageously good! 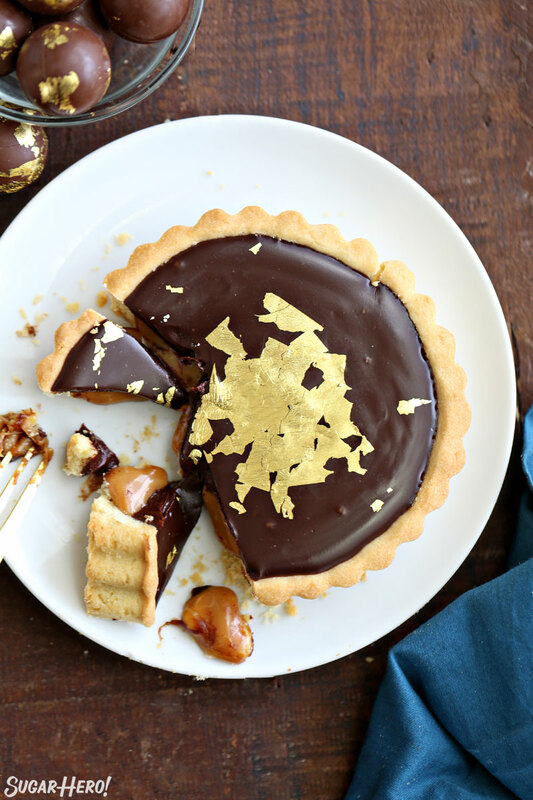 With their crispy and buttery tart shell, Baileys Irish Cream salted caramel filling, and glossy chocolate topping, they are delicious and absolutely gorgeous. This recipe yields 7 mini tarts, but they’re very decadent and many people would find half of a tart to be a satisfying dessert. So depending on your audience, this can either feed up to 14 people or 7 very happy people! Place the flour, sugar, and salt in the bowl of a food processor, and pulse briefly until everything is well-blended. Add the cold cubed butter and pulse until it is in small pea-sized pieces. Add the egg yolks and pulse in long 5-second bursts until the dough starts clumping together. Turn the dough out of the food processor and knead it lightly several times to incorporate any extra flour. At this point, the dough can be wrapped and refrigerated for several days. If you’re ready to use it now, spray seven 4-inch tart shells (with removable bottoms) with nonstick cooking spray. Press the dough in an even layer into the bottom and sides of each pan. Place the shells on a baking sheet and freeze them for 30 minutes. While they’re in the freezer, preheat the oven to 375 degrees F.
Spray the tops of the tart dough with nonstick spray, then press a square of foil onto the shells, shiny side down, and fill the foil with dry beans, rice, or pie weights. Bake the tart shells for 15-18 minutes, until the sides start to take on a little color and the centers no longer looks raw, then carefully remove the foil and weights. Bake for an additional 7 minutes, until the shells turn golden brown. Let them cool completely before filling. Unwrap the caramels and place them in a large microwave-safe bowl. Add the Baileys and salt. 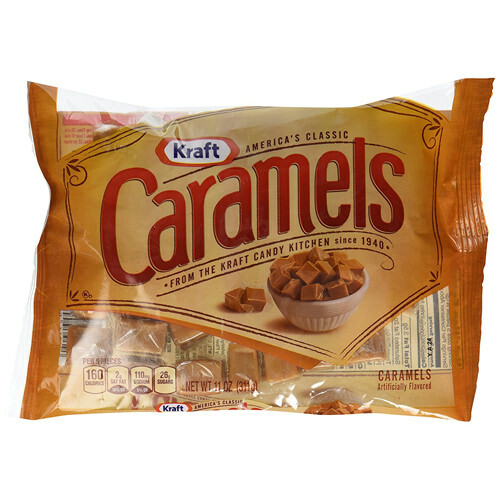 Microwave the caramels in 30-second increments, stirring after every 30 seconds, until melted and smooth. At first they will resist melting, but after 1-2 minutes they will soften and melt together. Switch to a whisk once they start to melt, and whisk the caramel until smooth and free of lumps. Let it cool to room temperature before filling the shells. 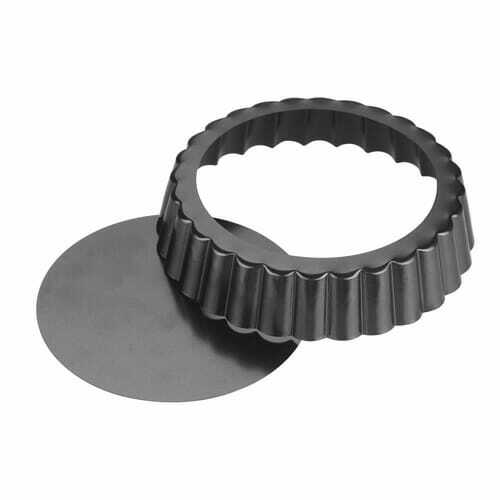 Before you make the ganache, start assembling the tarts. Remove the cooled shells from the tart pans and place them on plates. Place the chopped chocolate in a medium bowl. Pour the heavy cream, Baileys, corn syrup, and salt into a saucepan and place the pan over medium heat. Bring the cream mixture to a simmer, and once small bubbles appear all along the sides of the pan, pour it over the chopped chocolate in the bowl. Let the hot cream soften the chocolate for one minute, then gently whisk them together, until all of the chocolate is melted and your ganache is smooth and shiny. Add the room temperature butter and whisk it into the ganache until incorporated. Pour the ganache on top of the caramel in the tart shells, filling each one up to the top. Gently tap the tarts against the counter to smooth out the chocolate and remove any air bubbles. If you’re making these in advance and have time, you can let them set at room temperature—this will keep the ganache shiny and will give your chocolate a lusciously soft texture. If you need to speed the process up, refrigerate the tarts until the chocolate is set—this is faster, but the tops of the tarts often get dull during the process of refrigeration and coming back to room temperature. Once the chocolate is set, decorate the tops however you’d like—add a sprinkling of large flaked sea salt, a drizzle of caramel, a touch of gold leaf, a chocolate truffle—or all of the above! For the best taste and texture, you DEFINITELY want to enjoy these tarts at room temperature. How GORGEOUS are these tarts Elizabeth?! And that edible gold leaf on top?? OMGee! Totally over the top yummy! Wish I could grab that fork and devour one myself right now! sugar hero indeed!!! i don’t know where to start with these! love all the flavors, especially that Irish cream, but that pretty gold leaf really sets it apart. I’ll be looking for these at the end of my rainbow! Oh my gosh, Yum! Gimme chocolate. Love that caramel sauce too. Such luscious little tarts! 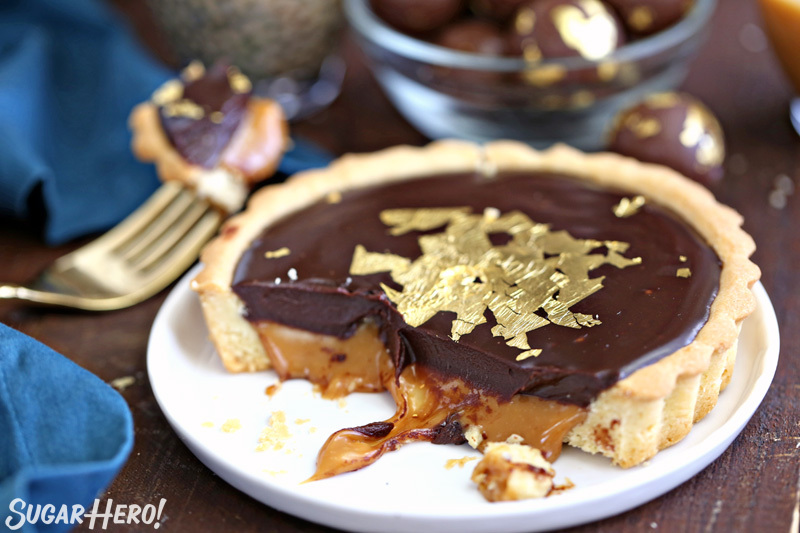 I absolutely love the gold leaf and that caramel is speaking to me!! Wow, I am super impressed. That ooozing caramel is killing me! So inviting and gooooorgeous all at the same time. So gonna make these. 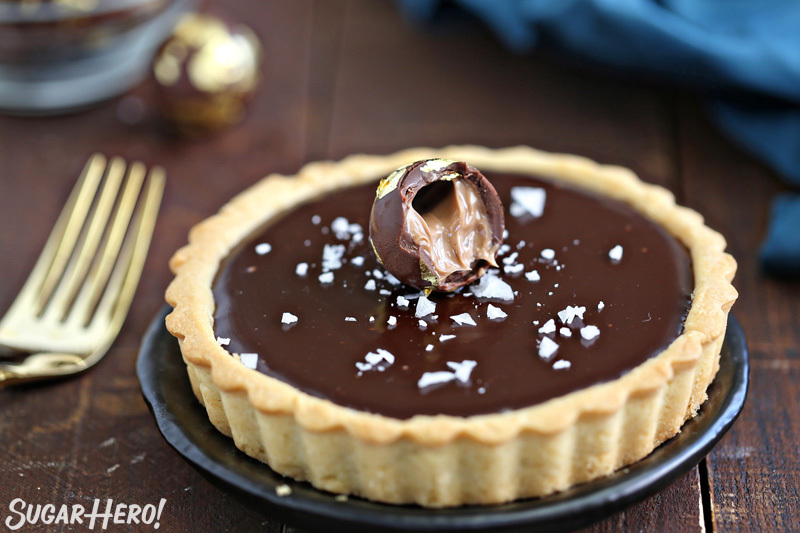 Thanks for sharing the little black dress tart secret recipe. I have had many tartfails and this one is gonna make me look like a hero. Thanks Sugar Hero! We obviously speak the same dessert language! Oozing caramel always elevates everything to the next level of awesome! These are amazing and I want to over dose on them immediately and the flecks of edible gold leaf are the perfect touch. Oh wow you had me at ooozy caramel! These look insanely delicious! Oh my! This has my name written all over it!! Thanks for sharing! AH! I am obsessed with these! So delicious! Stunning. 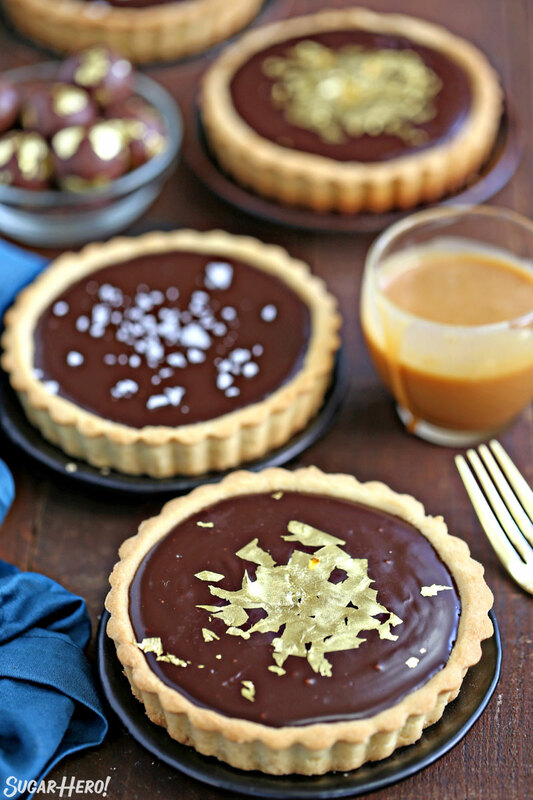 I rarely indulge in sweets, but wow, these lovely tarts are so tempting! All dressed up with edible gold leaf, they’d add a touch of elegance to a special occasion year ’round! It’s been a pleasure to connect with you through this link party Elizabeth… Happy St. Patrick’s Day! Ha! Ha! You sound like me. I always have every intention of sharing a holiday themed treat well in advance of the actual holiday but it either makes it onto the blog the day of the holiday or after the fact. So big kudos to you for getting it up ahead (I know how challenging that can be). 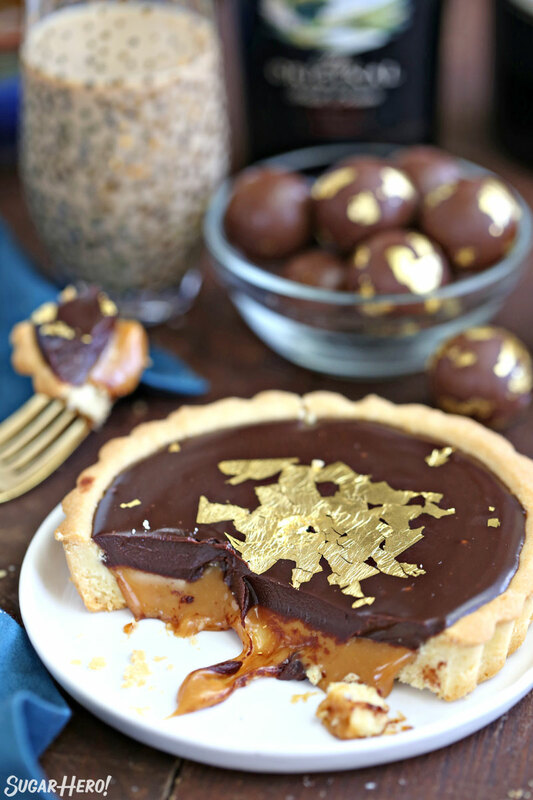 I’m definitely loving the gold leaf on these chocolate caramel beauties. I think it adds a level of elegance & sophistication to a holiday that is not necessarily known for that. I think it would also look cute with shamrocks cut out of any extra pie dough if gold leaf is not part of the kitchen arsenal (fortunately I have some still waiting to be used). And can we talk about that caramel oozing out from underneath that luscious chocolate? I don’t know how you could contain yourself. I would have scarfed the whole delicious thing down in one sitting. Yum! I always think about buying a bottle of Bailey’s but haven’t done it yet. These look SO delicious! They are definitely going on my “make soon” list! PS. Thanks for using store-bought caramels! Making caramel is one of those once-in-a-while things that I don’t look forward to doing. 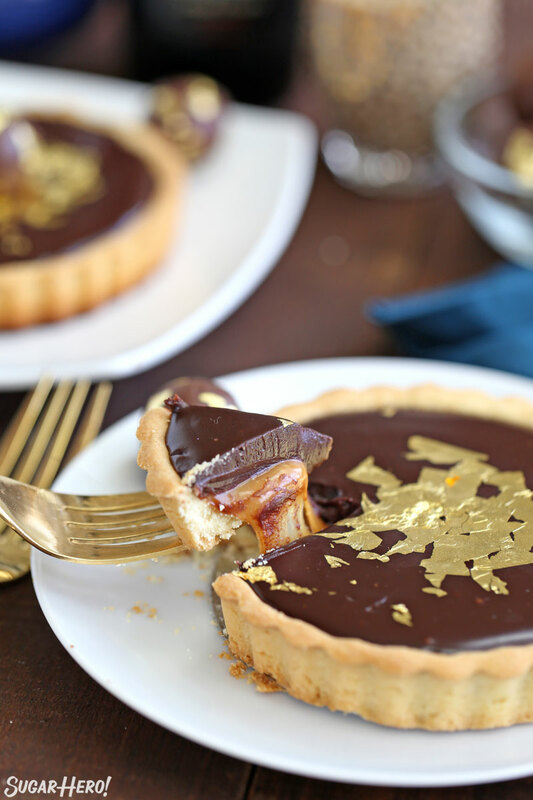 These are the most decadent tarts I think I’ve ever seen! One of the things I love so much about your blog posts are all the props! Everything matches so well. 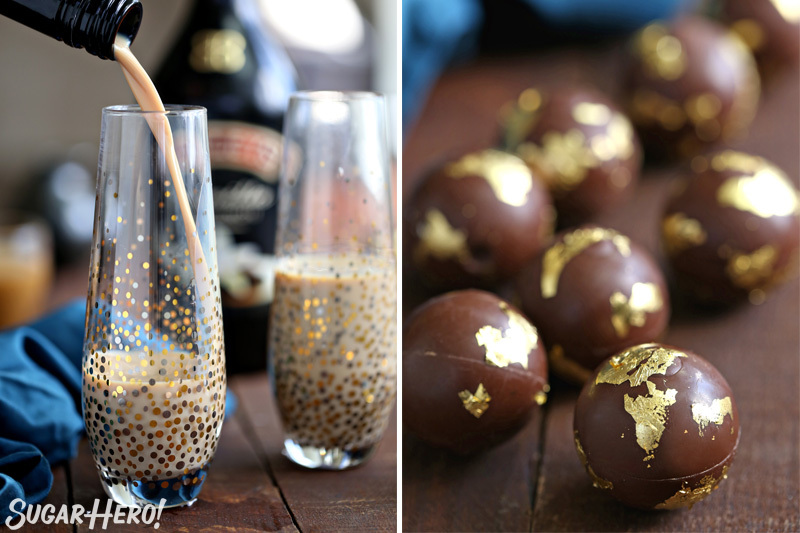 I love how you decorated the truffles with the gold flakes too. Oh! and the gold sprinkle cups are so pretty. I hate caramel that’s too runny and yours looks like the perfect consistency. Awesome! You had me at Bailey’s salted caramel. Omg. Love this so much! I have been searching for a recipe exactly like this for some time. I am going to make these for a children’s fundraiser that I am chairing, but I am absolutely no good at converting the amounts to cups. Would you mind terribly advising me on how to convert some of the ounces into cups. I would be forever grateful to be able to make these for our gala. Thank you so much. Have you made this in a 10 inch tart pan? If so, any adjustments? I have not, I think it would work just fine. The caramel might flow more making it a little messy to serve, but still delicious! Thank you so much! Can I make these the day before serving and leave them at room temperature over night? Can they be left at room temperature over night? Yes, absolutely! Leaving them at room temp will make sure the ganache stays shiny, and the chocolate and caramel both have a nice soft texture. Just made these today, and FYI your flour conversion is wrong. 10oz in cups is 1.25 cups, not 2.25! Hi Rosie, For all-purpose flour, 1 cup weighs 4.5 oz, so 10 oz is indeed 2.25 cups. The 8 oz=1 cup rule is only true for FLUID ounces (liquid measurements), all dry ingredients have different masses and thus 1 cup will weigh different amounts depending on what the dry ingredient is. Hope that helps. Can I make this in a pie tin with a premade pie crust? If so, how would you suggest I firm up the caramel so it isn’t quite as messy when I am cutting into slices? Por favor también lo puede traducir en español.? Mis disculpas, pero en este momento no tenemos las recetas traducidas en diferentes idiomas. Hi, I would love to make this it sounds sooo wonderful ! Do you think this could be made into a single tart? If so what size tart pan could I use ? Could I use something other than baileys? absolutely if you want to avoid alcohol you can substitute with an equal amount of heavy cream. You could also just substitute with your favorite liqueur if baileys isn’t your thing. Thanks! Wondering if I can make this in a springform pan? Yes, definitely. A springform pan would work just fine! Gorgeous! The caramel filling and glossy topping are a wonderful nuance which makes a big difference. Hey Apollo, Thank you so much! So glad to hear you loved it!